We are the recent, proud owners of a brand new American Fridge Freezer, and whilst it’s a fantastic piece of equipment, it has altered the layout of my kitchen somewhat, and that still needs attention. It’s amazing how a change like this can radically alter the look and feel of the room, even to the point of blocking light, and having to change the way I work in the kitchen when I’m cooking. So, I’m having to give some serious thought to how I revamp the kitchen to make it functional again, but without spending a fortune. An article by interior design specialist Sarah Slade, talks at length about the pros and cons of where to place fridge freezers and what you should think of when you’re about to purchase a new one, and it really has me thinking about how I’m going to tackle the problem. Our kitchen is 10 years old, but still fully functioning and relatively modern. In a perfect world, I wouldn’t be building a kitchen around the fridge freezer, but I can’t justify a complete new kitchen at this point. Sarah points out that you really should design your kitchen workspace around the unit itself, but this hasn’t been possible. Having been quite limited in where I could place the unit, I know have to fix some of the problems. It has blocked some light but I can fix that. I’ll add some new task and ambient lighting in the corner and perhaps position some reflective surfaces towards that space to enhance the natural light there. Check out the dimensions of your new appliance carefully and think hard on whether its size will offer balance into the room. Something too large will dominate the space and jar with the rest of the design, too small and it may not meet your family’s requirements. There are things you can do to minimise the impact of this not being quite right, when perhaps choices are limited. If it’s rather large think about how you can blend it into the room more. Sarah has a good tip in her article, and mentions a simple touch of sitting trailing plants on it, or creating units around it so it blends more with the current units. If it’s too small, fill up the space around it with narrow cupboards, wine racks or towel rails. 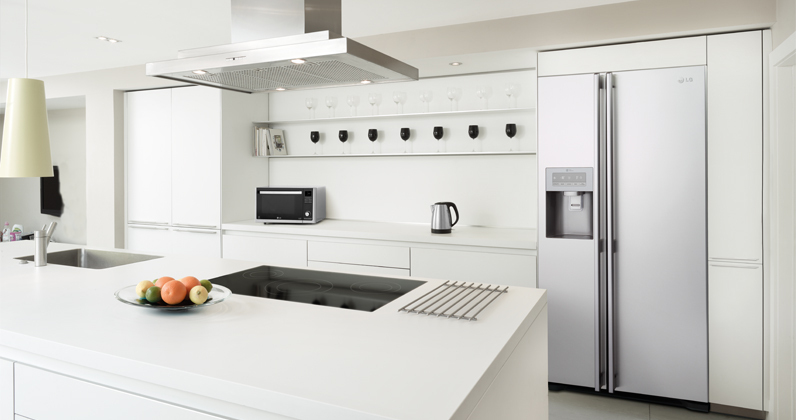 Any tricks that help the appliance sit more cohesively in the space will be worth it. Now you may not want to do this if you’ve just spent hundreds, or possibly thousands on a new appliance, but if you’re inheriting or buying second-hand there are lots of things you can do to personalise the look of it to help it blend into your kitchen. Add some blackboard paint and create a ready-made noticeboard. Paint it the same colour as your kitchen units to help it blend in. Or decorate with vinyl stickers or decor to fit with your interior or colour scheme. I’ve been thinking about using my Cricut Explore to make some wonderful decor for my fridge freezer. Hopefully that helps you think about the aesthetics of a new kitchen appliance and how it will or won’t fit into the kitchen. If you have any other ideas, I’d love to hear them. I need to buy a new fridge because the one I currently have is way too small to accommodate. That being said, I really like the suggestion you give to ensure that your fridge has the correct positioning when you replace it. You talk about how sometimes it can be hard because you have a fixed position to put the unit, however, adding supplemental lighting could help enhance the blocked lighting that the fridge could cause. I think that this is a great idea! Overall, being aware of where your fridge is could definitely help you increase the functionality of your space and create a more accommodating kitchen. I will keep this in mind as I’m looking for a new fridge. Thank you for sharing!